Home » » What do you know about the Barreleyes? Barreleyes, also known as spook fish (a name also applied to several species of chimaera). These fish are named because of their barrel-shaped, tubular eyes, which are generally directed upwards to detect the silhouettes of available prey; however, according to Robison and Reisenbichler, these fish are capable of directing their eyes forward, as well. 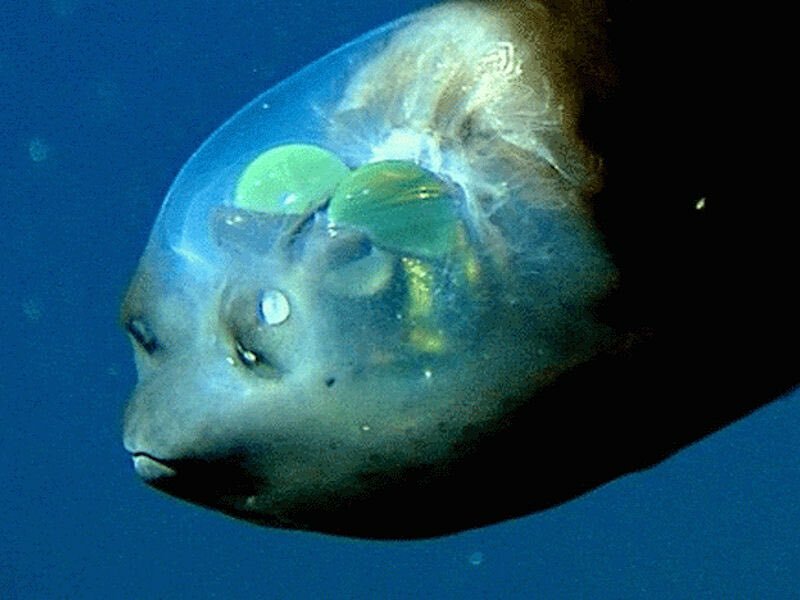 All species have large, telescoping eyes, which dominate and protrude from the head, but are enclosed within a large transparent dome of soft tissue. These eyes generally gaze upwards, but can also be directed forwards. The opisthoproctid eye has a large lens and a retina with an exceptionally high complement of rod cells and a high density of rhodopsin (the "visual purple" pigment); no cone cells are present. To better serve their vision, barreleyes have large, dome-shaped, transparent heads; this presumably allows the eyes to collect even more incident light and likely protects the sensitive eyes from the nematocysts (stinging cells) of the siphonophores, from which the barreleye is believed to steal food. Find out more 30 facts about the Barreleyes.